Miyabi mentions that she walks every day, and that she doesn’t really do things like ride taxis. Momoko hesitantly says that she took a walk recently. She tried walking to the station when she had free time, but found it tough. For Airi, she goes to work by train when her mother can’t send her by car, but she always gets confused about which station to head to. Looking it up on her mobile phone map doesn’t help either. Momoko: But walking really is something important. Miyabi: It really is important. According to Miyabi, it’s good to walk if you have the time, as it lets you relax while watching the scenery. Airi adds that it’s good to do early in the morning – though you’d have to wake up. Momoko, however, says that she can’t get up, and makes a comment about running. Momoko: Doesn’t running makes your sides sore?…… Doesn’t it? Eh, it doesn’t? Miyabi: Eh, does it? Doesn’t it just mean you’ve eaten too much rice? Airi: Maybe when you’re seriously running? Momoko wraps up by mentioning that walking on foot is good for health and dieting, so overall, walking is good for you. Momoko: Have you lost a treasure? Airi regales us with a tale of her losing her pass case, which contained her Pasmo and house keys. When she arrived at her house, she noticed that her pass case was gone. She could still enter the house because her mother was inside, but it was worrying because of the danger posed by the missing house keys. She backtracked to the places she had gone to, called up the train station, but it was still missing. Eventually she was contacted by her school about it. It turned out that within the contents of the case, there was something that had her school’s phone number. Since her Pasmo bore her name, the school was able to track Airi down and contact her. Someone had found her pass case and left it in the care of the police. Airi was a bit nervous to go see the police, but found them to be really kind. Airi: When it was returned to me, the police went, ‘Here you go, 100 yen‘. So I thought that they meant that I had to pay 100 yen to retrieve the missing item. But it turns out that they were confirming that there was 100 yen inside it. Airi adds that it had been missing for about two weeks. Momoko points out that there’d be enough time to make a copy (Airi: Stop it, you!). Airi didn’t find out who was responsible for returning her pass case, but she thinks that it was a nice person, since her Pasmo’s balance wasn’t used up. When the possibility of copies being made was brought up again, Miyabi chimes in, commenting that she thinks that it’ll be all right even if they had made copies, since they wouldn’t have had Airi’s address anyway. Miyabi mentions that it’s still scary, and she’d be in a panic if she lost her house keys. Momoko, however, reveals that she doesn’t have any keys on her, and she isn’t allowed to be in possession of the house keys by her parents. Miyabi: Seriously!? That- You’re already an adult, so it should be okay. Momoko: I asked for it, like ‘I want a spare key too!‘, and their reply was ‘Momo’ll lose it, so no‘. Airi asks what happens when Momoko comes back late due to work, but Momoko replies that she’ll wake her family up to let her in. It’s the same for Miyabi too. Airi asks what happens if her family members don’t wake up. Airi: Do you bang on the door, like ‘Gan gan gan gan gan‘? Miyabi points that she still has one, just for worst-case scenarios. Miyabi: I have one because you never know what’s going to happen. Momoko: Even Miya has one? Miyabi: I’ve got one, I’ve always got one. Momoko: Eh, no way, even MIYA has one? Miyabi: I make sure to have it. Momoko: Eh~ I want to have one too. Miyabi and Airi agree that it’s better to have a spare key with her. It also makes you a bit more careful not to lose it, and you can carry it in a key case. Momoko: I got it. So I’ll be bringing one from tomorrow. Momoko: In this situation, we can’t really say anything to him besides telling him to endure it… (Miyabi and Airi go ‘hmm‘ in agreement) Well, that’s the sort of problem it is, but he went ‘It might be a trivial problem, but it’s pretty serious to me‘… Since it’s serious to him, then for us as idols, we have to give a proper reply, right? Airi then mentions that you can read manga on the phone nowadays. In that case, he could even read them while on the commute to work. And that settles it. The girls are proudly surprised at how quickly they’ve come to a clear conclusion, which hasn’t happened in a while. It also eliminates the need to physically go to a manga cafe. If it’s the atmosphere that he enjoys, then he could make a quiet place of his own and read there. Miyabi: Wouldn’t it be good if he reads it in the washroom? But yeah, he could make a room for manga reading. The girls seem please that they’ve summed it up nicely, and wish the listener the best of luck. From the ‘recent announcements’ segment that’s usually skipped in these summaries, Miyabi has a Berryz Kobo-related announcement. 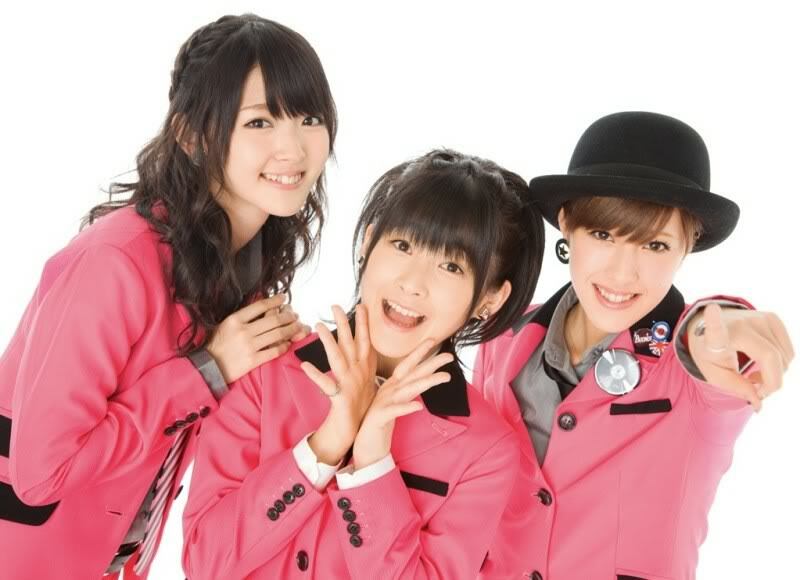 Miyabi: On the 12th of November, we’ll be releasing a new double A single – ‘Romance wo Katatte’ and ‘Towa no Uta’. Both are very Berryz-ish songs… Ah, not the both of them. Momoko: One of them, ‘Towa no Uta’ is really Berryz-ish. Miyabi: ‘Towa no Uta’ is very fitting with Berryz Kobo. An upbeat song. Momoko: Pretty rock-ish. The lyrics are pretty upbeat, but serious at the same time. It really feels good. Miyabi: ‘Romance wo Katatte’ is in a different genre from our usual. I guess it a ballad? Momoko: It’s in the cute camp, and it’s refreshing. It’s rare for Berryz to get something refreshing. It’s refreshing and cute. But a little mature at the same time. 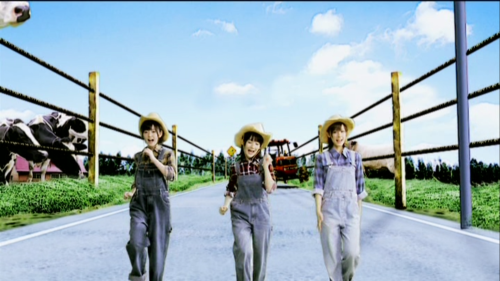 Miyabi: The outfits are like that too. There’s a great gap between them. Momoko: They contrast one another. Miyabi: Please make sure to check it out.